Anyone studying long term weather forecasts should check this out! Download and view GRIB weather forecast data. Built for sailors. Recommended for everybody interested in weather. Available in the Apple App Store. Applications which have been created with great attention to detail are a pleasure to use, and this is how it should be. LuckGrib is one of those applications. The design goal for the application is to present a simple user experience, without sacrificing the power and flexibility you expect from a first class application. The LuckGrib application and server software were designed from the ground up to perform at the highest levels, while constantly achieving high quality results. Watch as the weather smoothly animates as you change forecast times. Switching between GRIB files happens in the blink of an eye. Download new weather forecasts from the speedy LuckGrib server cluster. Once you experience this level of performance, going back to lesser applications will be impossible. Downloads in LuckGrib are delivered from a server cluster, setup in the cloud which is ready and waiting for your requests. You’ll find familiar global models such as GFS, CMC and WW3, as well as some less common global models: GDPS, GFS Ensemble, RTOFS, DWD Wave and ASCAT. Regional models are also available - and they are awesome. Regional models often feature a much higher resolution and may be updated as frequently as every hour. For the complete list, explore the GRIB Models area of this site. LuckGrib obtains its data from NCEP/NOAA, Environment Canada, Météo-France, Deutscher Wetterdienst (DWD) in Germany and OpenWRF. None of those organizations are charging for their service. If they are able to run their computer centers, gather the information to feed to their computer simulations and make all of their results free to the public then we think that should be passed on to you. LuckGrib takes its cues for the presentation of weather graphics from professional weather forecasting organizations, such as NCEP. Smooth contours. Highs and lows positioned accurately. Streamlines available to show winds in the tropics. Behind the scenes are sophisticated math and smooth interpolation. In front of you are the graphics you would hope for. Reading images that are presented with this attention to detail is easier, less distracting. You find yourself forgetting the application and simply exploring the weather forecasts, to understand what they are saying. You can view the overall picture of what is going on with the graphics, but when it is time to explore the details, those are also available. As you move the cursor around, the value at that location for all of the available parameters are presented - simple and easy. Meteogram views are also available - easily examine the forecast for at a point, or along a line, or along a vessel route. LuckGrib has been designed with the offshore sailor in mind. Perhaps, instead, you are in the Australian Outback? Anybody want to go explore some wilderness where there is no internet? Use the Offshore Data weather service to receive your forecast data via email, or directly via satellite. See: offshore.luckgrib.com for more details. Of course, what makes an offshore sailor an offshore sailor is that they sail long passages. While LuckGrib will not help these sailors with preparing their food, or with their boat chores, there are tools that will help with planning your passages. Easily build routes that describe passages from one beautiful anchorage to another. Are you looking for a good weather window to leave on that passage? LuckGrib can help with that too. 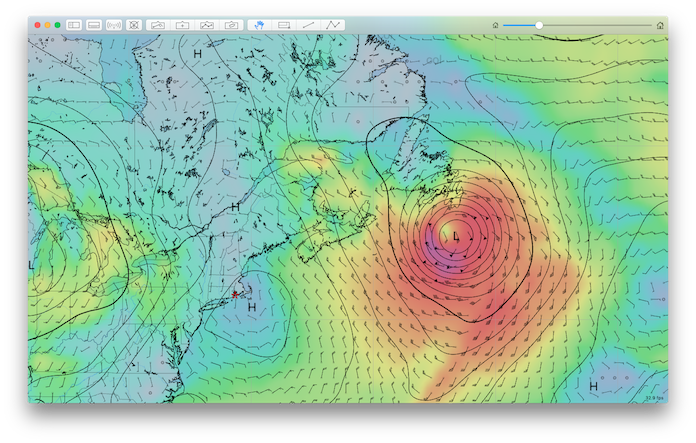 Download GRIB weather forecasts, pick a departure date and see estimates of where your vessel may be in that weather. Answering questions such as how the GFS and CMC weather models compare for your chosen departure date are easily answered. There are two GRIB file formats - version 1 and 2. LuckGrib supports them both. Do you already have an archive of GRIB data you want to import into LuckGrib? No problem. Do you have access to a service providing weather information in GRIB format? No worries. The work has been done so that you don’t have to sweat these details. How does today’s forecast compare to yesterday’s? How does today’s GFS forecast for two days from now compare to the CMC forecast for the same time? LuckGrib contains a librarian, keeping track of all your files. Simply select a file and the app will present it to you, in the blink of an eye. Switch between files with a single keystroke. Comparing weather forecasts and watching how they evolve has never been easier. Have the librarian search the files and present only those that match some criteria. Do you want to only view GFS files? How about only the files used for passage planning? Where were those files related to Cyclone Pam? Let the librarian help you out. The LuckGrib viewer is elegant, fast, and functional…. a must have app for all sailors using Macs for weather work. LuckGrib…is a huge step forward in both functionality and ease of use when compared to anything else I have used. …For several years I have used LuckGrib before every ocean passage. The app is visually attractive, easy and quick to learn and use, and provides the weather information I want. I highly recommend LuckGrib. I would like to use Apple's Family Sharing - will that work? I want to run LuckGrib on iOS and macOS - do I need to pay for both? How can I see only the files I want in the list? Does LuckGrib support the ASCAT (or OSCAR, RTOFS, COAMPS, HRRR, RAP, ...) GRIB model? I really like LuckGrib - can I help test new versions?